This has been a controversial issue in the Roundhouse for years, but things really heated up when Catholic Church lobbyist Allen Sanchez accused opponents of the measure of “racism” in the wake of the proposal’s defeat during the 2018 Legislature. It is clear that the church hierarchy has fixated upon pre-K as the solution to New Mexico’s very real social ills to the exclusion of most anything else. In the wake of the 2016 brutal death of Albuquerque 10 year old Victoria Martens, Sanchez claimed (without a shred of evidence) that such deaths could be prevented if a statewide pre-kindergarten program existed. This is the nub of the issue: Does universal “pre-K” provide the real and conclusive benefits that its advocates claim? While the archbishops and Sanchez fixate on the “permanent fund” it is worth noting that $37 million was added to such programs from the General Fund during this legislative session alone. Since 2012 pre-K funding has more than doubled to $270 million annually. This increase has come despite significant budget challenges in our state. In one example, the report stressed that 69 percent of kindergartners who attended pre-K were reading at grade level. That’s a slight improvement over the 66 percent reading at grade level who hadn’t attended pre-K. Similarly, low-income eighth-graders who attended pre-K scored higher on the PARCC reading exam than a comparable group who didn’t attend (723 compared to 721) — but that’s still far below the exams’ proficiency cut-off score of 750. According to the LFC, improving the effectiveness of children’s teachers in K-12 had a dramatic impact on children’s academic proficiency, exceeding that of pre-K by a large margin. In just two years, low-performing schools participating in the “Teachers Pursuing Excellence” peer mentoring program increased the percentage of students scoring at or above proficient: from about 24 percent to almost 35 percent in reading and from about 16 percent to 27 percent in math. Further, the researchers reported that “(t)eacher absences are associated with decreased student proficiency rates in both reading and math” — finding that student achievement was 50 percent higher in schools where teachers simply come to work. There have been numerous policy proposals over the years that specifically addressed the attraction and retention of excellent teachers and getting those teachers into needy and underperforming schools. Furthermore, the Martinez Administration has made teacher attendance a point of emphasis. 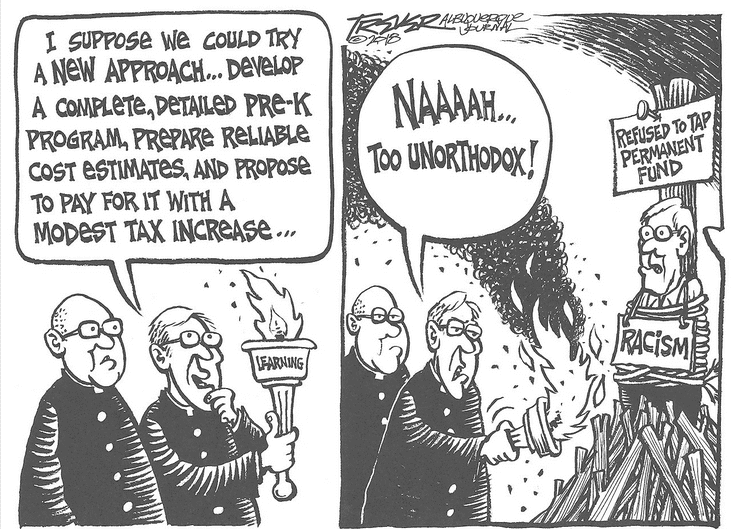 We have not seen support for these proposals from the church or other “pre-K” advocates. It is unclear what is motivating the church to involve itself in public policy debates in such a partisan and controversial way, but it is clear that their position is not based on hard research or any specific church teaching. Worse, their harsh stance toward anyone who disagrees with them on the merits of their policy proposal is downright un-Christian.